$100 billion each year. That’s the cost to the economy, in medical bills and lost wages, of back pain. Some of the people who suffer the most back pain are immigrant laborers, who pick vegetables and fruits like strawberries in a bent-over position all day. 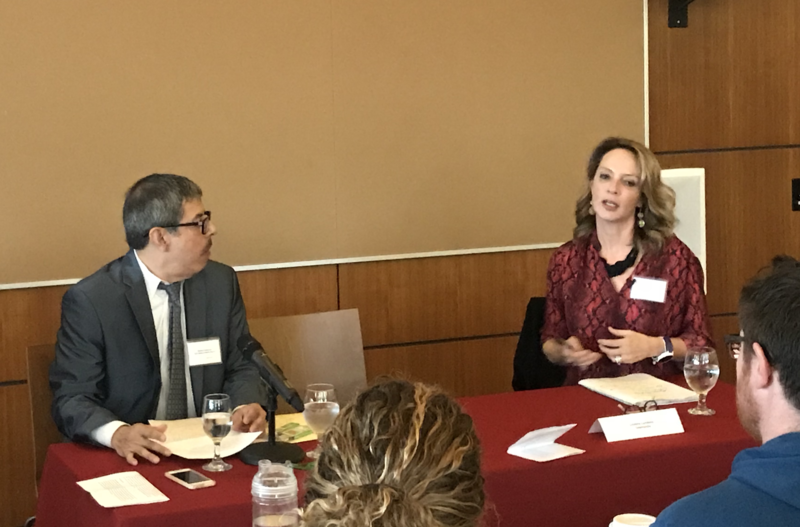 “A lot of immigrants believe that back pain is just a part of life — part of the price they pay for being here,” Cristina Londoño told a group of 2018 California Fellows last week. Londoño, a national correspondent for Telemundo, became interested in the project after she began to suffer lower back pain and started to seek out ways to treat her own ailments. Londoño’s 2017 National Fellowship project, “On Broken Backs” documented the pain and struggle of immigrants dealing with back pain — and the lengths they go in search of relief. Farmworkers are among the most vulnerable, Londoño said, and an estimated one-third of agricultural laborers suffer from debilitating back problems every year. One woman she interviewed has been disabled for six months and is barely able to move. Ruben Castaneda, a health and wellness reporter for U.S. News & World Report, focused on another aspect of immigrant health for his fellowship project. He wanted to capture the terror many U.S. immigrants are experiencing under The Trump administration's aggressive enforcement of immigration policies. He wrote five stories, covering the health ramifications of immigration-related fears, and the innovative ways that health care workers are responding to these crises. “Living with uncertainty can be harder and worse for your health than living in a situation where you know something will happen,” said Castaneda. For the project, Castaneda flew to Portland, Oregon, where he spent a week interviewing people at a community health center serving many immigrants. He also spent a week in Los Angeles to do additional reporting before returning to the U.S. News office in Washington, D.C. It was a strategy that ultimately helped him see fresh story opportunities in his work: “The more interviews you do earlier, the more possible stories you can see,” Castaneda told Fellows. He originally envisaged two stories springing from his reporting trips: a piece on how Trump’s rhetoric and policies were causing widespread terror among many school kids with immigrant parents, and a piece on how nearly 800,000 DACA recipients were dealing with the uncertainty caused by the prospect of Trump ending the program. Eventually, he wrote five stories based on his reporting. Both reporters had to win the trust of families who were undocumented for their projects. When it comes to gaining such trust, Londoño says she has a slight advantage in working for Telemundo over other media outlets. “The Hispanic community knows us,” she said. “So it always helps.” Still, over the past year she says she has done more anonymous-silhouette interviews with altered voices than ever before, in 20 years of reporting. “People are terrified, even with us,” she said. When Londoño comes into a home to interview someone for a story, she has some strategies. She arrives at the location and gets out first, without the cameraman. If it’s a home, she’ll start talking with the kids — on their level — which puts everyone at ease. “I never interview a child without talking to them first,” she said.